Take Current Affairs quiz February 1, 2019 to enhance your General Awareness. Practice with our esteemed Current Affairs quiz February 1, 2019 questions which covers all important events across India as well as World. Make use of all important Current Affairs quiz February 1, 2019 questions with answers updated here, at free of cost to succeed in all competitive Exams and Interviews. Who is appointed as the interim CEO of Yes Bank? Ajai Kumar is appointed as the interim CEO of Yes Bank He will hold the charge of managing director and chief executive officer till the new CEO Ravneet Gill joins the lender. Under which Ministry does the Department of Industrial Policy and Promotion (DIPP) function? The Department of Industrial Policy and Promotion (DIPP) functions under the Ministry of Commerce and Industry. The Department of Industrial Policy and Promotion (DIPP) has been renamed as ________. The Department of Industrial Policy and Promotion (DIPP) has been renamed as the Department for Promotion of Industry and Internal Trade with a mandate to deal with matters related to start-ups, facilitating ease of doing business among others. The order has been approved by President Ram Nath Kovind. As per the Ministry of Finance, how much GST was collected in the month of January? The government said that Goods and Services Tax (GST) collections crossed the Rs.1 lakh crore mark in January. RBI introduced a new framework called, Prompt Corrective Action (PCA) to regulate bank's _________. RBI introduced a new framework called, Prompt Corrective Action (PCA) to regulate bank's Non-Performing Asset (NPA). What are the 3 banks did the Reserve Bank of India (RBI) lift its curb from Prompt Corrective Action (PCA) framework? RBI lifted its curb on 3 banks, Bank of India, Bank of Maharashtra, Oriental Bank of Commerce, as it breached PCA framework parameters of crossing 6% net. How much did the government announce for the Defence Ministry in the Interim budget 2019? The defence budget has been increased to over Rs.3 lakh crore. Additional funds for defence will be provided if needed. How much did the government announce for the PM Kisan scheme in the Interim budget 2019? Govt has announced that it is to allocate Rs.75,000 crore per year to support farmers’ incomes. Who is appointed as the Director General of National Cadet Corps (NCC)? General Rajeev Chopra is appointed as the Director General of National Cadet Corps (NCC). Which country to take on Italy in Davis Cup World Group qualifiers? Scientists Develop Artificial Pancreas Smartphone App For Diabetics. Which state govt gave approval for Smart Village Campaign worth of Rs 385 crores? Punjab state govt gave approval for Smart Village Campaign worth of Rs 385 crores. According to National Sample Survey Office (NSSO’s) survey result, which country unemployment rate hit 4 decade high of 6.1% in the year 2017-18? According to National Sample Survey Office (NSSO’s) survey result,India unemployment rate hit 4 decade high of 6.1% in the year 2017-18. Are you looking for right place to enhance your Knowledge on Current Affairs of 1st February 2019 through effective Quiz section? 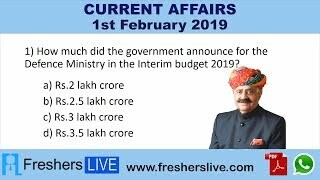 FreshersLive grants you the advantageous Current Affairs Quiz questions with accurate answers for 1st February 2019 which covers all the important events, supreme Awards, major occurrences in the National as well as World level. All important Current Affairs Quiz questions of 1st February 2019 are updated instantly in this page. Everyday at least 25+ Current Affairs Quiz Questions are displayed in this FreshersLive page. Correct Answer for each quiz question is given at the end of the entire 1st February 2019 Current Affairs Quiz questions section. You can estimate and upgrade your GK by attending these useful quiz questions. Entire quiz questions of 1st February 2019 Current Affairs covers Competitive Exam as well as Interview point of essentially important topics like International News, National News (ie. Indian Affairs), Science & Technology News, Environmental News, Bills & Acts Passed by Government, Defence News, About important Persons, Places, Banking & Economical News, Awards & Honours, Sports News, Revolutionary Updates on Arts & Culture, Obituary, Summits & Conference, Important Committee, Schemes, Appointments, Important Days & its Theme for Current as well as upcoming Year, Books & Its Authors, Agreements & MoUs, Budget, Taxes, Various Important Lists & Indexes, Visits by World Presidents, Prime Ministers, Political affairs and all Current Events. 1st February 2019 Current Affairs Quiz Questions updated in this page are prepared in the sense to help all aspirants to succeed in various Competitive Exams like UPSC IAS and other Civil Services Examination, Various Bank exams like IBPS PO, IBPS Clerk, SBI PO, SBI Clerk, RRB PO, RRB Assistant, Insurance exams like LIC AAO, UIIC Assistant, Railway Exams, Various Central Government Exams like SSC CGL, SSC CHSL, and more. Attempt all the Current Affairs Quiz Questions of 1st February 2019 and evaluate your score by matching your response with the correct answers mentioned at the end of this quiz questions section. By practising the FreshersLive Current Affairs Quiz Questions on a daily basis, you can surely succeed in the competitive exams as well as the interviews easily. Make use of this ultimate resource to the fullest and quickly achieve your goal!